A Hallmark in the Global Gems & Jewellery Industry. 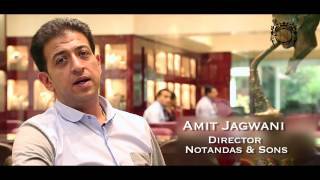 Notandas Jewellers is all set to look at new avenues so as to reach out to their clientele. Notandas Jewellers is a brand that emphasizes excellence and offers jewels that allure discerning individuals who expect unparalleled quality. With an effort towards offering its patrons with jewellery that is exquisite and glamorous, Notandas Jewellers displays its magnificent collections of gold, polki, kundan, jadau, diamond and gnstones. Opulent and innovative, the jewellery collection from Notandas Jewellers captivates the everlasting essence of Jadau and adds a contemporary twist to it thus making each piece a symbol of extraordinary magnificence!